After 2.5 years of hard work, lack of sleep, and constant coding, today we are happy to announce that SimplCommerce has reached the RC state. Unless significant bugs emerge, we will release the first version of SimplCommerce next month. 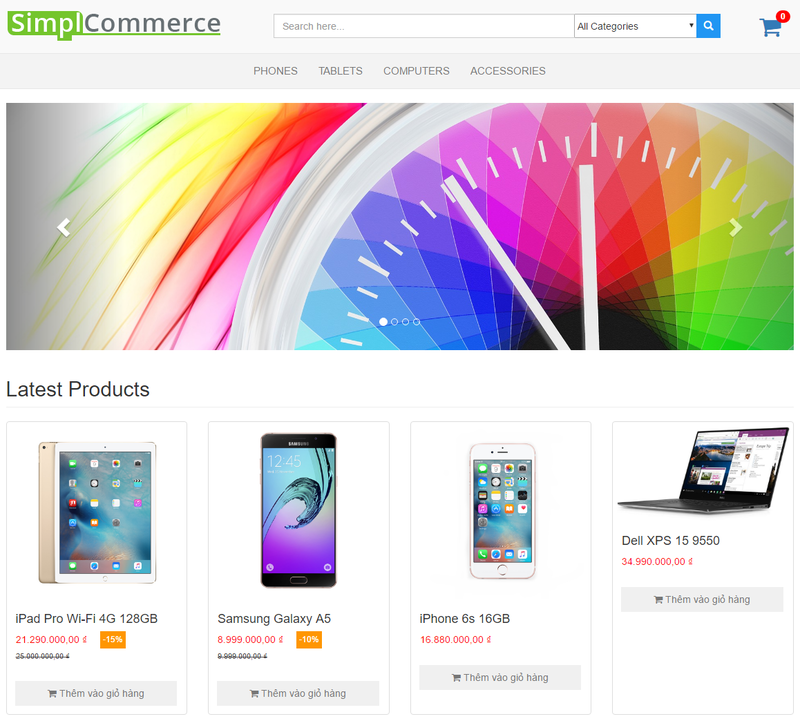 SimplCommerce is a cross platform, modularized ecommerce system built on .NET Core. It can run well in Windows, Linux and Mac. You can use SimplCommerce with SQL Server, PostgreSQL or SQLite. MySQL will be supported when its provider for 2.1 being released. Generally, you can use SimplCommerce with any databases that Entity Framework Core support. See the docs for more details on how to work with different databases. How to get started? Super easy, download a self-contained version of SimplCommerce at https://github.com/simplcommerce/SimplCommerce/releases/tag/v1.0.0-rc pick up the Windows or the Mac version depends on your OS. Self-contained means that you don’t need to install anything to run the website. All you need to do is extract the zip file then double-click on the file SimplCommerce.WebHost.exe (Windows) or type ‘./SimplCommerce.WebHost’ and hit Enter in the Terminal (Mac). Let us know how you think. As a .NET developer, my primary programming language is C# and Azure is the my first choice when thinking of the cloud. Recently, I have joined an interesting project that the customer requested us to use ASP.NET Core with Aurora database and host in AWS. They prefer AWS because they already have several applications there. They also want to optimize the hosting cost and prefer using open sources. Actually they requested us to develop the application in PHP, but we have convinced them to use .NET Core. We said to them that Microsoft has changed and .NET Core is awesome. It’s super fast, fully open source and can run very well on Linux, bla. bla… And finally they agreed. EC2 was not a preferred option because with EC2 we have to manage the VM: manually setup load balancing, scaling etc. AWS Elastic Beanstalk seems to match our need. It is quite similar to the Azure Web App. However, .NET Core 2.0 along with 1.1 are only supported on Beanstalk’s Windows platform. A little disappointed. ASP.NET Core run very well on Linux, how can we leverage that. Fortunately, Beanstalk supports deploying from docker containers. Sweet! with Docker containers, we can define our own run time environment. Although we have an automated docker build and the docker image is published on docker hub, this docker image is used for testing purpose only. To be more convenient, entity framework migration, seeding data are run automatically and it is not suitable for production. For SimplCommcere we choose PostgreSQL over Aurora or MySQL because I see PostgreSQL provider for Entity Framework Core is much more stable than MySQL. Login to the AWS Console (I am using Free Usage Tier), go to RDS and create a new PostgreSQL database. I chose Dev/Test for the use case. In the Specify DB details screen -> Instance specification. Check the option “Only enable option eligible for RDS Free Usage Tier” and leave others options as they are. In the settings section, filling your DB instance identifier (I filled with simpldb), the master username and password. In the step 4: Configure advanced settings. Make sure the “Public Accessibility” is Yes. You can turn it off later but for now we need to connect to it and execute some scripts. Fill your database name (I filled with simpldb) and leave others as default. Then click on the button “Launch DB instance”. Wait for a couple minutes for the instance to be ready. In SimplCommcere, shop owners can upload images, documents for products and categories. The rich text editor (summernote) also supports upload files. By default, SimplCommcere stores these uploaded files in the “user-content” folder under the wwwrooot. Different with Azure Web App, in order to work in Beanstalk, the uploaded files have to be stored in an external storage like S3. 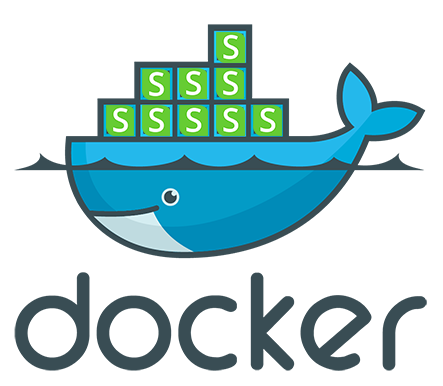 Fortunately, SimplCommcere has already support this and the “simplcommerce-eb” docker image has been configured to use Amazon S3. 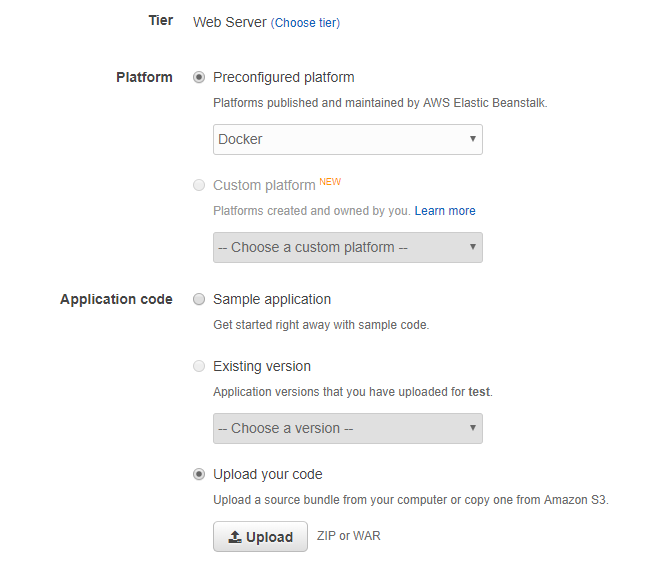 In AWS Console, go to Amazon S3. Create a bucket and make sure that you grant the public read access to this bucket. The first thing we need is “Dockerrun.aws.json”. Please see it below. It is quite simple. Where to pull the docker image? In our case it is simplcommerce/simplcommerce-eb, a publish repository in docker hub. Because it’s public, we don’t need to provide a credential for authentication. The container expose port 80. And the log should be written to /var/log folder of the host. By default our containers will stand behind a nginx proxy, and it’s configured to accept request having the size of the body under 2M. But we can configure to accept bigger size. An important note is that you need to configure security for Beanstalk and PostgreSQL so that they can talk to each others. This sounds weird because the PostgreSQL already has publicly accessible. Then back to your Beanstalk application environment. Click on Configuration then the setting icon in the “Instances” block, add the security group name of PostgreSQL to the “EC2 security groups”. Then apply. Congratulation! Your website is now up and running. Always looking for better ways to do thing is one of our principles for building SimplCommerce. Last week, I made another refactoring for our automated docker build by applying multi-stage builds. We were able to reduce the SimplCommerce image size from 900M to 145M (compressed). In this blog post, I will describe how we did that. First, let review the situation: We want to run a docker automated build for every change happens on master branch. One of our problems is that the docker image size is quite big around 900M (compressed). Because it have to include everything so that it can build the application by itself such as dotnet core sdk, nodejs, gulp, and all the source code. Recently, Docker has introduced multi-stage build. Because the SimplCommerce source code is using MSSQL, I run some SED commands (find and replace) to make it work for PostgeSQL. I also need to delete all added migrations and run add migration again the because the difference between MSSQL and PostgreSQL. dotnet ef migrations script -o dbscript.sql will generage sql script for the database schema. However, The generated sql file is utf-8 encoded which having issue when run by psql command. The runtime only microsoft/aspnetcore:2.0.0-preview2-jessie image is used as the base. We also need to install postgresql-client in order to execute .sql scripts. When the docker run it will execute the docker-entrypoint.sh which will connect to PostgreSQL create database, tables and insert some pre-defined data if needed. ASP.NET Core is the next generation of ASP.NET. Many people are learning ASP.NET Core, most of them have already known ASP.NET. So I think it is good to have a summary of the different between them. Web.config .json, .ini, environment variables, etc. Please let’s me know if you find out more. Today, we have upgraded from project.json to csproj for SimplCommerce. It’s simple than what I have thought. In this blog post I will share you this journey. While working with ASP.NET Core in SimplCommerce, I felt in love with project.json. It’s an innovation, modern and simple. However, in order to make the tooling compatible with other .NET app models (WinForms, WPF, UWP, ASP.NET, iOS, Android, etc. ), Microsoft has decided to move .NET Core projects to .csproj/MSBuild. More detail about this can be found here. 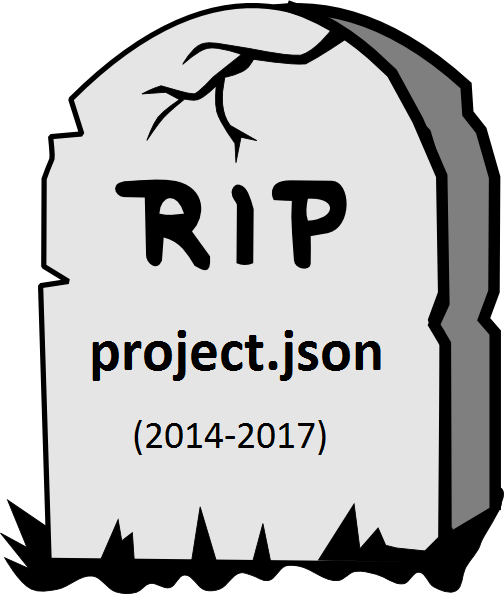 Struggling for a while, we finally decided to say goodbye to project.json. Microsoft doesn’t support .NET Core csproj on VS 2015. So, to work with csproj, we need to install VS 2017 RC or go with command line. I chose to install VS 2017 RC :). I use the lasted version of VS 2017 RC which included .NET Core 1.0 SDK – RC4. After installed VS 2017 RC. I opened the SimplCommerce.sln. 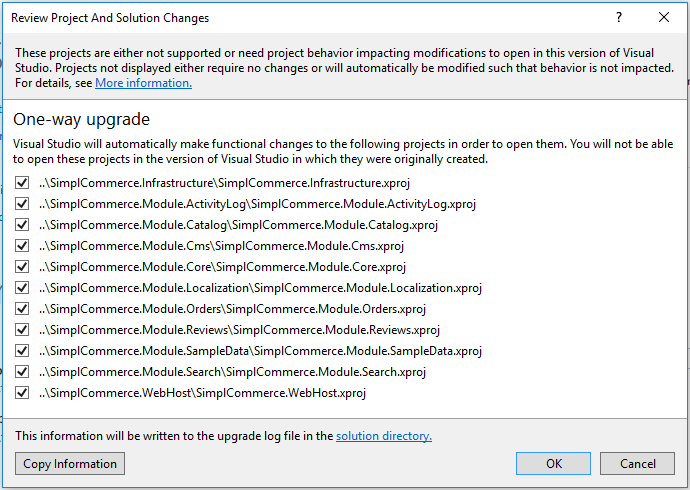 VS 2017 show a dialog and ask for an upgrade. Note it’s an one way upgrade. Once upgraded, you cannot go back. Took a deep breath and click OK. Whoo! sucessful, the migration report show no error, there was a warning on the solution file but it not important. All the projects are loaded. Wait “Error occurred while restoring NuGet packages: The operation failed as details for project SimplCommerce.WebHost could not be loaded.” appeared in the Output panel. None of the project can build because all the dependencies could not be loaded. Right click on the solution and then click “Restore Nuget Package” didn’t work aslo the same error appeared. Tried to workaroud in VS 2017, no luck. All the projects build sucessful. Control + F5 the application run just fine. Let take a look at what have changed. All the file project.json, **.xproj was removed. The global.json is removed also. 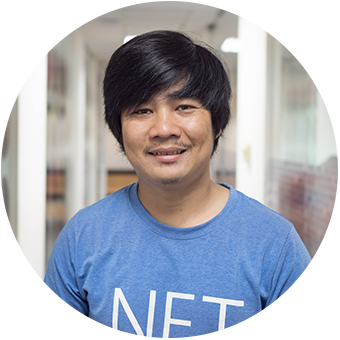 Although you might encounter some issues during the development because the tooling is not stable, .NET Core and ASP.NET Core definitely are the future of .NET. I believe that after the tooling reach RTM and with the release of .NET Core 2.0 and .NET Standard 2.0 (expected in Spring 2017), the adoption rate of .NET Core will increase significantly. ASP.NET Core is very different from the ASP.NET that you have already known. For example: there is no System.Web.dll, HTTP Modules, HTTP Handlers, Global.asax or Web.config. ASP.NET Core is a significant redesign of ASP.NET. The most important ASP.NET Core principle I think you have to remember is the modularity. ASP.NET Core is a composition of granular NuGet packages and everything is excluded by default. That means you might need to add some packages when you need some features. And by this way you only take the minimal set of packages you need. An IDE. In theory, you can use any editor to code .NET Core. However, I would recommend you to use Visual Studio. It’s the best IDE to code .NET. My second recommendation is Visual Studio Code. Some of my friends use Visual Studio for Mac, but I haven’t. .NET Core SDK or NET Core tools for Visual Studio if you use Visual Studio Download here. Create an asp.net core project and take a quick look at the project structure and generated code. 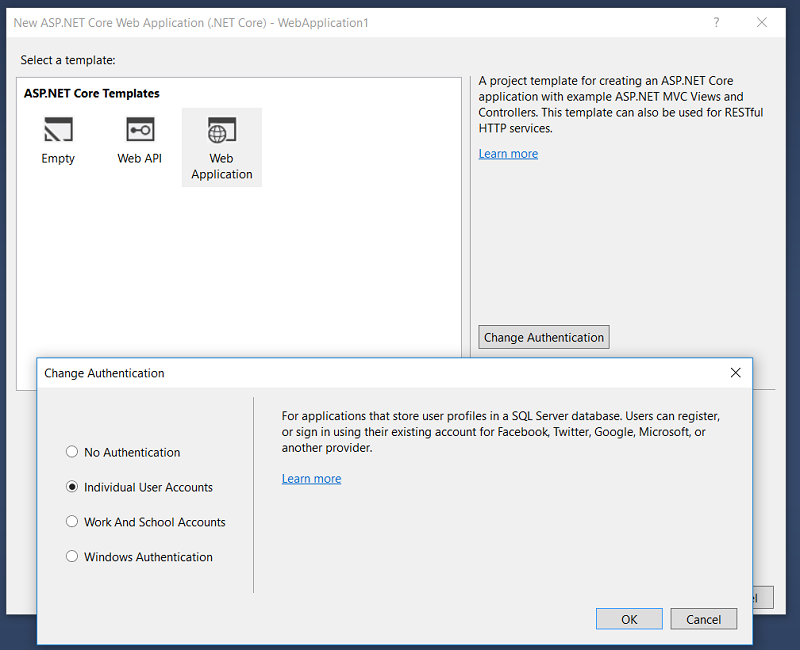 By default ASP.NET Core Identity use a string value for the primary keys. In SimplCommerce we decided to use a long value instead. We also changed the name of identity tables and run some custom code every time a user login into the system. In this blog post I am going to show you how we did it. Modularity is designing a system that is divided into a set of functional units (named modules) that can be composed into a larger application. These modules can be developed or maintained separately. Putting both the database and the website into one box generally is not a good practice. I have decided to make changes. The first thing I do is separating the database and the website. For the database I use the default images of postgres without any customization. “Separating what changes from what stays the same” is always a good practice. So it’s a good idea to separate the source code from the sdk. With this in mind I created simpl-sdk docker image. 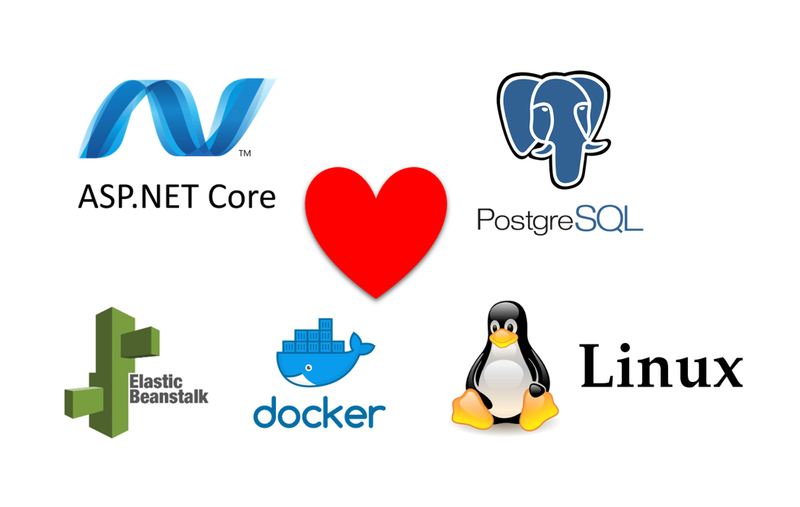 I need dotnet core 1.1 project json sdk, nodejs, gulp-cli and postgresql client. It make scene to start from microsoft/dotnet:1.1.0-sdk-projectjson then install other stuffs. Now the Dockerfile for simpcommerce become very small and clean. From the simpl-sdk, copy the source code into the image, restore nugget packages, build entire the projects, call gulp copy-modules to copy the build output of modules to the host. Copy and set the entry point. First I am not familiar with writing a shell script. Second, I am also not familiar with psql. Third some weird differences between linux and windows. 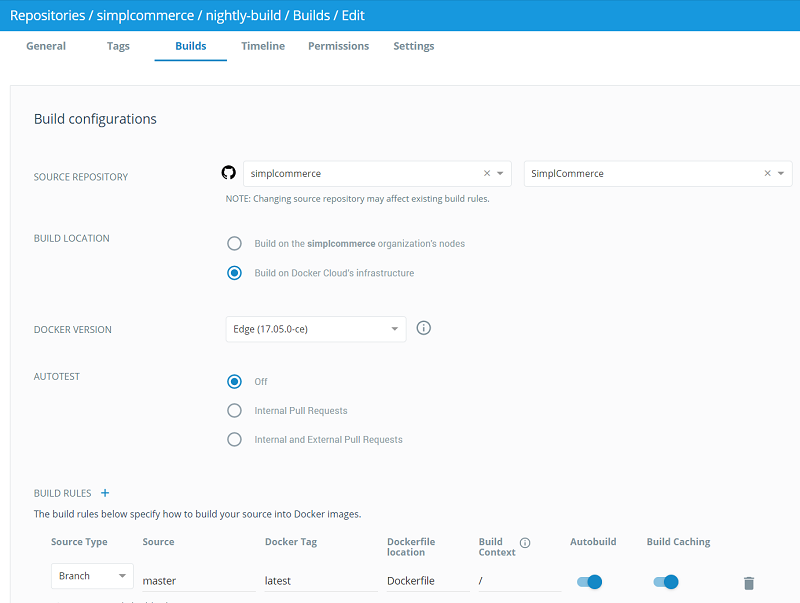 One single command docker run -d -p 5000:5000 simplcommerce/nightly-build, waiting a couple of minutes for docker to pull the images and start the container. Then open your browser, type localhost:5000 and you got a shopping cart website written by aspnetcore up and running. Yahoo!!!!. In this blog post I will describe how I did it. As you might know. 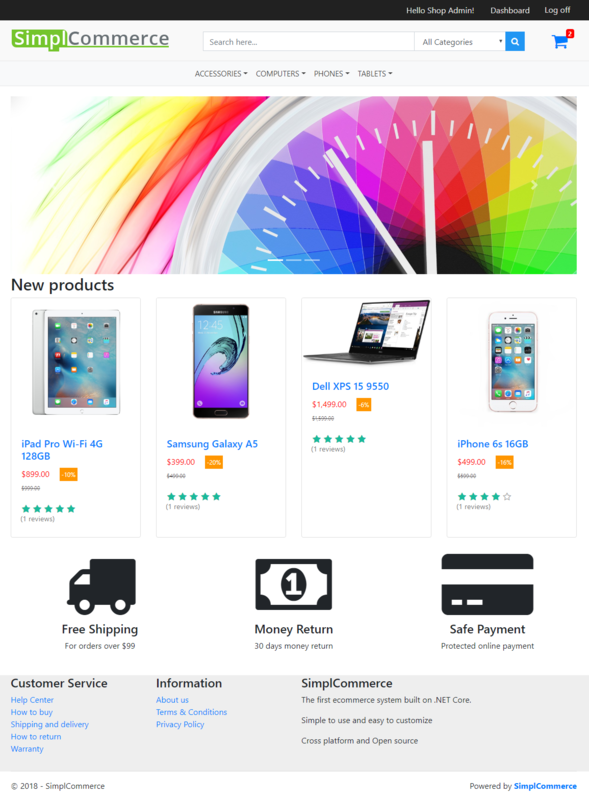 I am developing an open source, cross platform and modularized ecommerce system built on .NET Core which called simplcommerce. It should be as simple as possible to for anybody who want to try simplcommerce. We have a demo site here, but it will be more interesting to have it run on local, especially in a docker container. The image should be created automatically every time we make a change on the github repo. Fascinating! But, to be honest. I am new to docker and the Linux world, I have some general knowldege but no real experience. After reseaching for a while, reading many articles, tutorials about putting an asp.net core application to a docker container. But most of them are very basic, just a hello world application. So it took me a while to figure how to dockerizing simplcommerce. Last night, finally I dit it. How to run a gulp task there. The simplcommerce are composed by modules and a gulp task need to be run to copy modules to the host. For the first challenge. In docker hub, I found that we can create “created automated build” from a github repository. Yeah, that’s cool. So, just create one and then connect to simplcommerce github repository. In the build setting, I check the option to make the build happen on pushes, and specify the location of the dockerfile. Yeah, a real world dotnet app run perfectly on a docker container. One command to setup everything and here we go. This is my first baby step to docker and linux, It may be not perfect. So if you can give me suggestions, I will be more than happy.